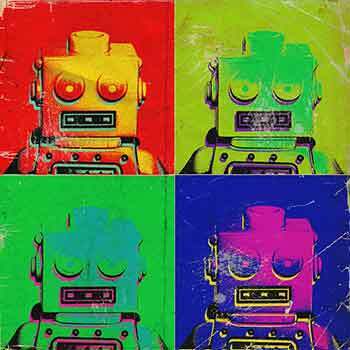 The O’Reilly Solid Podcast: How using robots for artistic purposes changes the way we perceive art. The short film Box caused a sensation in 2013 by effortlessly blending industrial robots and projection mapping — physical and digital. Bot & Dolly, the studio behind Box, specialized in robotic cinematography until it was bought by Google in 2013, becoming part of Google Robotics. 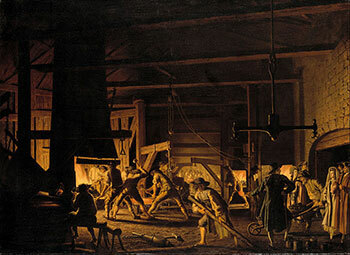 Sometimes overlooked amid the spectacular effects it developed in-house was the significance of Bot & Dolly’s software platform: it was an abstraction layer that worked as a plug-in for Autodesk’s Maya design software, putting otherwise arcane industrial robots in the hands of any production designer who could wield a mouse. The O’Reilly Solid Podcast: Distractions, wearables, and reference peanut butter. In this episode of the Solid Podcast, David Cranor and I talk with Jim Stogdill, one of the key figures behind the launch of our Solid conference, about some of the cool pieces of hardware that we’ve come across recently. The O’Reilly Solid Podcast: A discussion about critical issues for hardware startups. Hardware is getting more accessible, which makes hardware startups more appealing. A small team can develop a viable prototype for a simple product on a few hundred thousand dollars, and even tricky problems like autonomous cars are within the reach of startups. Incubators and accelerators like Highway1, Lemnos, and HAX have played an important role in making hardware accessible; they help their portfolio companies work through the tricky engineering, manufacturing, and marketing problems that software startups don’t have to deal with. In our new episode of the Solid Podcast, David Cranor and I have a wide-ranging discussion with Ben Einstein, co-founder and managing director of Bolt, one of the leading hardware startup accelerators. The products of the future will impact not just factories, but all aspects of business. Register now for Solid Amsterdam, October 28, 2015, where Dirk Slama will present the session “Managing the ‘Clash of Two Worlds’ in the IoT.” Editor’s note: this post is an excerpt from “Enterprise IoT: Strategies and Best Practices for Connected Products and Services,” by Dirk Slama, Frank Puhlmann, Jim Morrish, and Rishi M. Bhatnagar. In some cases, a distinction is made between the industrial IoT and the consumer IoT. But when we talk about “Enterprise IoT,” our focus is less about specific application domains and more about openness and integration maturity. Here, we will take a closer look at some of the more industrial applications of Enterprise IoT, starting with a discussion about how IoT will transform manufacturing from the perspective of both product engineering and production technology. Making sense of the intersection between connected devices, accessible hardware, and synthetic biology. Register for Solid Amsterdam, October 28, 2015 — space is limited. I don’t usually describe conferences as “mind expanding,” but in this instance, the description is justified. At O’Reilly’s Solid 2015: Hardware, Software & the Internet of Things, held recently at Fort Mason in San Francisco, I encountered startling views of the future, thoughtful presentations on creative combinations of exciting new technologies, and warnings about what might happen if somehow it all goes wrong. Dozens of speakers and presenters covered topics ranging from synthetic biology to augmented reality helmets to 3D printed automobiles. The audience was a mix of software developers, hardware designers, traditional manufacturers, digital manufacturers, academics, entrepreneurs, and venture capitalists keen to spot the next major tech trends. A look at the interdisciplinary learning paths you'll find at Solid. Flipping through the schedule for our Solid conference, you might wonder why we offer talks on synthetic biology in the same program that includes sessions on smart factories and how to ship goods within supply chains. The answer is that Solid is about a nascent movement — new hardware — that draws on a lot of different areas of expertise. It’s about access and the idea that physical things are becoming easier for anyone to create and engineer. Understanding hardware and the Internet of Things, then, is critical for every technologist and every company. Solid’s program has emphasized interdisciplinary learning from the beginning; we’ve seen that a smart, accessible, connected world will need contributions from a lot of different backgrounds: designers, electrical engineers, software developers, executives, investors, entrepreneurs, researchers, and artists. The keynotes that we’ve lined up will provide an overview, and a sense of how widely impactful this idea is; they touch on design, manufacturing, urban futures, synthetic biology, government, innovation, and techno-archaeology (a topic we’ve explored in the Solid Podcast). And they’ll wrap up with a thought-provoking talk — with a demo — on how we experience flavor. After lunch on Wednesday and Thursday, the program gets broad. The O'Reilly Solid Podcast: Andy Cavatorta and Jamie Zigelbaum on art that combines physical and digital. One of the theses behind our Solid Conference is that the stacks — the ranges of knowledge that technologists need to understand — are expanding so that the formerly separate disciplines of hardware and software are merging. Specific expertise is still critical, but the future lies in systems that integrate physical and virtual, and developing those effectively requires the ability to understand both sides at some basic level. Installation art is a great place to look for those seamless integrations, and we’re excited to feature a couple of interesting installations at Solid. Our latest episode of the Solid Podcast takes us to Flatbush Avenue in Brooklyn, home to a collective of designers and engineers called Dark Matter Manufacturing, where David Cranor and I spoke with Andy Cavatorta and Jamie Zigelbaum. Cavatorta and Zigelbaum both create installations; Cavatorta works with sound and robotics, and Zigelbaum’s projects explore communication and interaction. A free compilation of chapter excerpts from our IoT library highlights the approachable complexity of hardware. 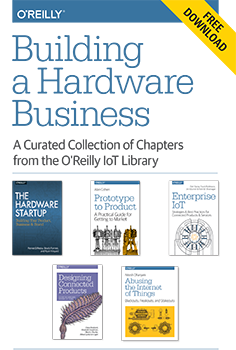 Download a free copy of “Building a Hardware Business,” a curated compilation of chapter excerpts from our IoT library. Over the last few years, we’ve seen an astonishing change in what it takes to build a hardware business. Hardware remains hard — executing it well requires technical and marketing expertise in several fields — but the barriers that startups must cross have been lowered considerably. That change has come about as a result of several changes in the way the market approaches hardware. Customers, whether consumers or businesses, have become aware of what hardware and connected devices can do for them. The Internet of Things means more than connected refrigerators now. For consumers, it represents desirable products like the NEST thermostat and Apple Watch. For managers, it represents the highest standards of informed decision-making and operational efficiency in everything from delivery fleets to heavy machines to simple design-driven data. Connecting with those customers has become easier. Startups can sell directly to niche consumers through online channels with the help of Etsy, Tindie, and ShopLocket, which are vastly easier to deal with than big-box retailers. These platforms also return rapid market feedback and offer ways for companies to connect with their consumers and build communities without intermediaries. Funding has become available through new mechanisms at every stage. Crowdfunding helps entrepreneurs test their ideas in the marketplace and raise enough money for early development. Venture capitalists, impressed by recent exits and aware of the vast green fields awaiting the Internet of Things, are willing to invest. Supply-chain managers like PCH are willing to take equity stakes in return for invoice financing, addressing a critical cash-flow challenge that can be a big barrier to startups looking to have products manufactured in large quantities.